“‘All I could see was umbrella ribs. The umbrella strained and pulled and I felt us driving along with it. I braced my feet and held back on it…. ‘What’s the matter?’ I took the oar. A man can get by without an umbrella, but he should have one anyway. It’s much like wearing hats in the winter – just a sensible thing to do. A well-made umbrella can shelter you from the rain, wind, hail, [light] snow, and even the sun when you’ve had enough Pimm’s cups on a summer’s day. Since its invention, men have wavered on whether this accessory was best left to the ladies or not. Even when not deemed overly feminine, there was a time when a gentleman would never open it at all. Well there’s no form and function there. Unless you’ve summited Everest lately or field dressed a deer in under 10 minutes, then set that notion aside and pick up the umbrella. If you must only have one, then buy a classic black stick umbrella. If you should have two, then also get a telescoping travel size. I prefer three. The last is something in the middle either in size or color. Carry a proper umbrella. Full length. Full crook. Dark. There are many great brands who pride themselves on adherence to timeless quality and style. 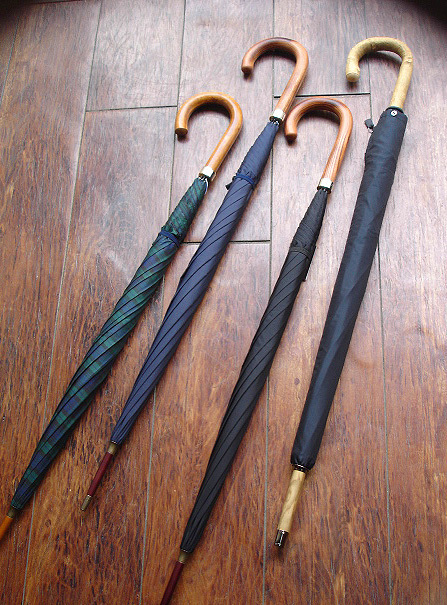 Fox Umbrellas (pictured) and Turnbull & Asser are a couple. Leighton makes an affordable model, but be wary of their many other, less tasteful stock. Try not to stray too much with this one. Pinstripes can be a subtle addition, perhaps, but a gentleman needs a classic umbrella. It’s true that any gentleman all-to-familiar with the airlines will likely prefer a travel sized umbrella. Even if you choose a telescoping, there are great makers and brands like Barbour who sell a crook that fits in your briefcase. It’s a very masculine but requires minimal space. The Barbour branded travel umbrella featured here is a stylish and surprisingly affordable buy. Plus, it stashes nicely in your waxed jacket. Go for color. Canary yellow is a great contrast to the crowd, especially good for summer, and no one will call you cross. Alternatively, a bold red or blue can do the trick. What never fails? Tartan. On right, Bespoke Post has fashioned a great medium-sized solution: The Stanton. Besides our affinity for the name, this is one of the most versatile and stylish mid-sized umbrellas we’ve come across. Learn more about the making of it here. Always offer your umbrella to a woman when it is raining. That’s also a reason why you carry one in the first place (like your pocket square). Furthermore, you should offer to carry it for her. If neither of you are spoken for, you’ll do well to offer her your arm. Don’t shake your doused umbrella within the building once you’ve arrived. Some poor soul will slip on your account. In general, many still believe it’s bad luck to open your umbrella indoors. That may just be the Irish, but perhaps they also figured out it’s hard to fit out the door at that point. If well made, and there are two of you in the boat, it can also function as a sail – at least momentarily. 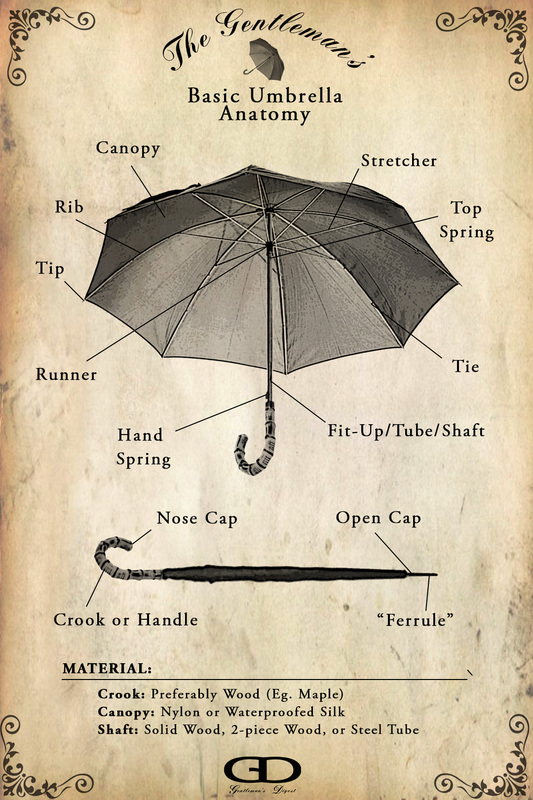 If you are wanting to know the ins and outs of the accessory before you buy it, here is a basic guide to the anatomy of umbrellas.